Leon Bailey (l.) has been one of Bayer Leverkusen's stars of the season so far. Two clubs who have enjoyed contrasting fortunes over the past eighteen months, Bayer Leverkusen and RB Leipzig, go head-to-head in the standout clash of Matchday 12 on Saturday (kick-off 15:30 CET/14:30 GMT). At the BayArena on Saturday, there is every chance of another goalfest much like what we saw in this same fixture last season. In spite of being ninth, Leverkusen boast the third best attack in the Bundesliga this term with 23 goals scored, while Leipzig have managed 18. Striker Kevin Volland is the hosts' man on form, with six goals for the season and two in his last three outings, while wingers Julian Brandt and Leon Bailey have contributed four apiece. Visiting duo Timo Werner and Emil Forsberg should also be running high on confidence. The former already has eight goals in all competitions this term, and netted for Germany in Tuesday's 2-2 friendly draw with France - while the latter helped Sweden reach the 2018 FIFA World Cup with a sensational play-off win over four-time champions Italy. That is the immediate form of these teams, but the two sides have been a model of the drastic change in fortunes for many teams seen in the Bundesliga over the last year-and-a-half. Eighteen months ago, Leverkusen secured a fourth consecutive qualification for the UEFA Champions League, having finished the Bundesliga season in third behind Germany's dominant duo, Bayern Munich and Borussia Dortmund. A division further down, RB Leipzig were celebrating a historic first promotion to the elite, having only come into being as a fifth-tier side in 2009. At the time, nobody could possibly have imagined that within the space of just a year and a half, Leverkusen would have lost some of the spark that has made them one of Bayern and Dortmund's nearest challengers over the past decade. And that Leipzig, top-flight rookies, would have emerged as perhaps the most credible threat to the Bavarians in their quest for a sixth consecutive title. So how did it all come about? Leverkusen have sold some of their most influential players in recent years, including Heung-Min Son, Gonzalo Castro, Ömer Toprak, Hakan Calhanoglu and Chicharito, while some of their star performers - such as Stefan Kießling, the league's top scorer with 25 goals in 2012/13 - have lost a little of their shine. Worse, their Bundesliga rivals appear to have wised up to their style of play. "Every opponent has a plan against us," top scorer Volland admitted a few weeks ago. "We really noticed that last season, when we thought we'd be able to counter-press. It didn't work, because everyone knew how we were going to play." Leverkusen's inability to catch their opponents off guard led to a disappointing 12th place last term - their worst Bundesliga finish since coming 15th in 2002/03. That spelled the end of Roger Schmidt's near three-year reign, with Heiko Herrlich taking the helm over the summer. After a shaky start - with defeats to Bayern, Mainz and Hertha Berlin - the former B04 striker finally seems to have got his side back on track, and they will go into the Leipzig game unbeaten in seven in all competitions. Watch: Leverkusen have a new star in Leon Bailey! Leipzig had a very different 2016/17. Championing an exciting brand of attacking football that would not have looked out of place at the BayArena a few seasons ago, Ralph Hasenhüttl's fearless young charges swept to a remarkable second place in their very first season, even finishing three points clear of Dortmund. Admittedly, they were also 15 points shy of champions Bayern - and the gap that still separates them from Germany's most successful club was brought home only too clearly at the end of October, as they suffered back-to-back defeats to Jupp Heynckes' side in the DFB Cup and the Bundesliga. Yet even if they are still a little short of the very highest level - they have also lost UEFA Champions League games away to Besiktas and Porto this term - Leipzig have demonstrated that last year's incredible maiden campaign was no false dawn. With seven wins from 11 league outings, they are currently in second place, four points behind leaders Bayern and six ahead of ninth-placed Leverkusen. "The season is going very well," Dayot Upamecano told Bundesliga.com in an exclusive interview. "You can't get away with anything less than 100 per cent In the Bundesliga, so we're trying to win every game. We're delighted to be second in the table because it shows we're building on the success of last season." Between a Leverkusen side trying to muscle their way back into the European debate and a Leipzig outfit determined to prove they belong at the top, Saturday's encounter promises to be a fascinating one, especially if it is anything like last November's meeting at the BayArena. In spite of going behind to Kevin Kampl's – who has now swapped clubs since this previous encounter - strike in the very first minute, Leipzig twice came from a goal down to triumph in a five-goal thriller, with captain Willi Orban grabbing the winner nine minutes from time. That 3-2 success enabled the visitors to make history, becoming the first newly promoted Bundesliga side to go 11 games unbeaten at the start of a season. Watch: Highlights of the five-goal thriller in this fixture last season! "It certainly won't be easy, but we're going to Leverkusen to win," Upamecano, who at just 19 is emerging as one of the league's best centre-backs, said when asked about this weekend's game. "We know that they are tricky opposition who pose a real threat in attack. They want to be playing in Europe again, but if we play our way, with plenty of intensity, we'll get a good result." Curiously, Slovenian midfielder Kampl joined Leipzig from Leverkusen this summer in order to "develop further as a footballer", in a move that would have been seen as a step down until very recently. Time will tell just how far they can go, but there is no denying that Leipzig have shaken up the pecking order since bursting onto the Bundesliga scene. Victory over Bayer this weekend could simply be the latest chapter in German football's changing of the guard. 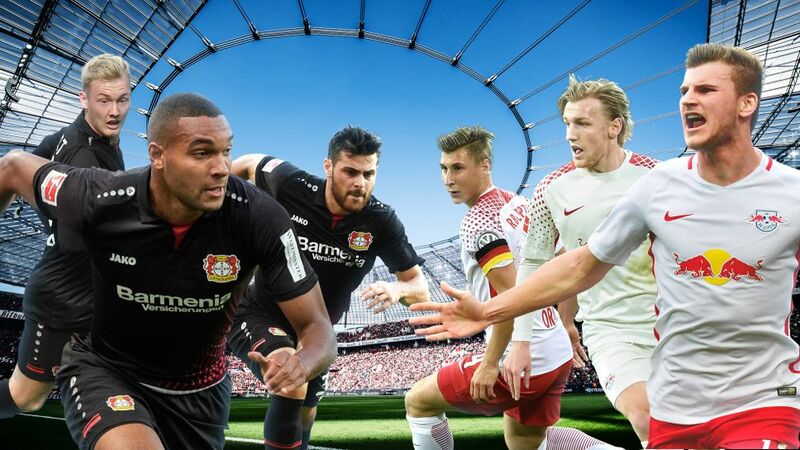 Click here for the Bayer Leverkusen vs. RB Leipzig match centre!